Let's begin with the human body and the way it is drawn Manga style. To begin, we need to know how to draw a normal human body so we can then do our own Manga style. 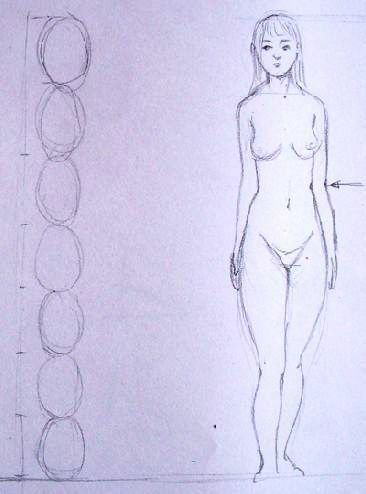 To draw a body, we use the head as a scale. Bodies are drawn using from 7 to 8 heads, depending on the height of our character. The elbow rests at the same height of our waist and hands reach the upper part of our thighs. Shoulders fall (they are not straight) in a female body. A Manga style body is drawn in a different way; its trunk is shorter and legs are drawn longer and thinner. Speaking about proportion, heads seem bigger than a normal body would. It gives the impression of being younger than they really are. Their arms are delicate.